Since gaining independence in 1957, Ghana has focused on improving access to education and achieving universal enrolment. Primary education became free in 1961 and the 1980s saw major reforms swept through the education system, including restructuring primary and secondary education and introducing vocational classes. The benefits of the Ghanian government’s focus on education are reflected in the country’s rising literacy rate. According to UNESCO statistics from 2010, the literacy rate among 15-24-year-olds is 85.72 percent, compared with 34.89 percent in those aged 65 or older. Despite these measures, many children, particularly those living in rural areas, struggle to stay in school. Economic necessity forces children to drop out of school in search of work, and girls are often charged with looking after younger siblings and helping with domestic work. NGOs are attempting to address these issues at the community level and ensure every child has access to education. Johnson Ayonka is the director of the Grassroots Transparency Initiative at WillWay Africa, an NGO that supports low-income communities in health, education and economic empowerment. Jo Hallett works with Ghana School Aid and Let’s Read Ghana to provide grants to schools in rural communities and support the teaching of English in the far north of the country. Al Jazeera spoke with Ayonka and Hallett about the realities of getting an education in Ghana today. Al Jazeera: What effect has the recent removal of secondary school fees had on both children and schools? Johnson Ayonka: It has had an impact, but because the national government is inefficient, the money from the central government doesn’t always get to the communities. In the very poor communities, there is the wider problem of poverty that’s forcing people to drop out, despite education being free and some schools are still charging fees because the money from the government didn’t get to them. Even though the intention behind the policy was good, the government was not well prepared to implement it to the fullest. They also tried to implement it from the centre, instead of from the local area and the money was not made available in advance. It was sort of “putting the cart before the horse”, instead of the money being there before the policy, the policy comes and then the money. The policy is OK, the students have enrolled because they know that they’ll get free education, but after that, we find out that nothing effective takes place because what is needed is not there because of bureaucracy and inefficiency. Al Jazeera: What are the barriers still preventing access to education today? Jo Hallett: In the last few years, there has also been quite a push on more school buildings and a big push on enrolment and I think that [the Ghanaian government has] done very well on getting the vast majority of children into school, [but] there are huge barriers to accessing education. There’s a serious lack of trained teachers. In many of the schools we go into, the majority of the staff are volunteers or student teachers. 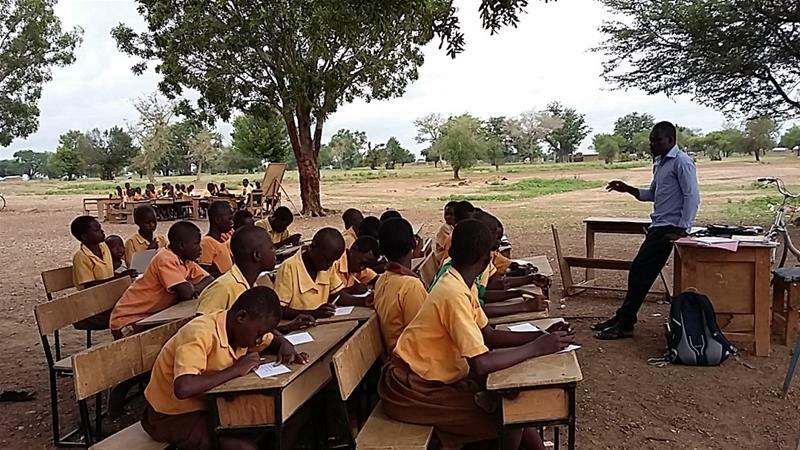 There’s a lack of finance for schools in general, so although the children are there, the buildings are not there, although overall they have improved, lots of schools have either very poor buildings or no buildings at all; they call it “under the tree” so classes are taught under a tree. There’s a lack of equipment and a lack of books and resources, the training of teachers, finance of all sorts and that needs to be addressed. Often the teachers don’t get paid for several months because the District Education doesn’t have the finance to pay them and, therefore, there’s a lack of commitment on their part to some extent. Class sizes also vary enormously. A good teacher can manage quite a big class but sometimes it’s overwhelming: you go into a classroom and there are 70 pupils in there and one teacher who may not be trained, who’s trying to manage them and it’s impossible really, it’s really difficult. There’s a lack of finance for schools in general, so although the children are there, the buildings are not there … lots of schools have either very poor buildings or no buildings at all. Al Jazeera: How are rural communities affected? Hallett: In many rural areas, the families are involved in subsistence farming or illegal mining and, with farming, the children get pulled out of school for harvest and sewing. Another really significant thing that we see is the complete lack of spoken English in the rural areas. In school, after the first couple of years, the education is in English. There are 52 languages in Ghana, but the common language, and the language of government, [and] the language they’re expected to learn in is English. If you live in a town, the chances are that you will see English sometimes and hear it, but out in the rural areas where we go in the far north, they speak a language called Guruni, which is spoken in a very small area, and it’s not written down at all so there aren’t any signposts or posters so [children] don’t have text in the environment, either in their own language or in English. Al Jazeera: Do girls face additional challenges to entering education? Ayonka: At the primary level the gender gap is small, it’s very, very small, and that indicates that a lot of progress has been made in the education of girls. But as girls mature into their teenage years, they face a lot of challenges because there’s a lot of gender disparity in terms of who should do house chores, so girls suffer more. When you get closer to higher levels of education, even though the gap has reduced over the years, it’s still there because cultural factors come into play and there are issues of early marriage and families spending more on boys than on girls. Al Jazeera: What steps should the government take now? Ayonka: What we see recently from the government is that a lot of policies and actions are done in isolation. Let’s say you see an area where there’s a high instance of teenage pregnancy and you don’t also make arrangements for the education authorities to work with the healthcare authorities and social workers; even though there’s free education, you are still going to get low enrolment because there is no coordination. Another problem is the issue of access to the education infrastructure, there’s free education on paper but the schools are few, especially in the rural areas. You can say you want to give free education to people but if you don’t give them physical access to the schools by building more schools, then you still don’t have free education … I think communities need to be empowered to build their own schools, to recruit their own teachers, monitor the teachers and make sure that the standard of education is high. There’s a big gap between what is happening at the government level and what is happening at the community level. Hallett: There needs to be a bigger commitment to funding and a raising of the status of teachers. [The government] has done some really good things, some of the curriculum books are excellent, but they also need to have a bit of money and resources to back up that commitment, but I do think Ghana is trying hard.